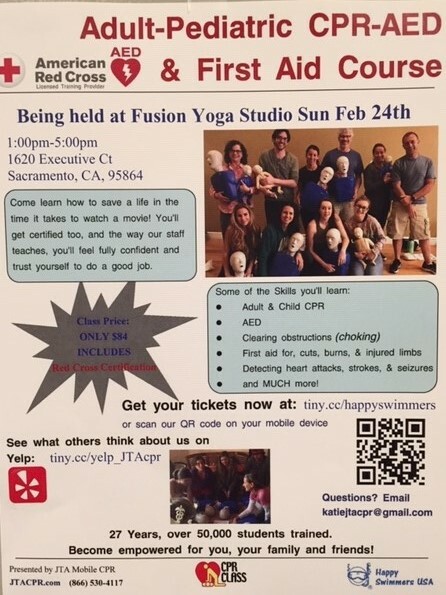 RED CROSS CPR COURSE – April 28 :: FUSION Yoga Studio Sacramento, Inc. If you would like to register for this CPR & First-Aid Course, please register with JTA Mobile CPR by going to tiny.cc/happyswimmers. Location of course: FUSION YOGA STUDIO, 1620 Executive Court, Sacramento, CA 95864. Fusion Yoga Sacramento is on Facebook. Click here to become a fan!